 Vagnsset med 3 personvagnar typ DB "Rebuild Cars" "Club 2017"
Vagnsset med 3 personvagnar typ DB "Rebuild Cars" "Club 2017"
By buying this product you can collect up to 2094 bonuspoints. Vagnsset med 3 personvagnar typ DB 'Rebuild Cars' 'Club 2017', fabriksinstallerad innerbelysning, totallängd över buffertar 67,2 cm, epok III. Prototype: 3 different German Federal Railroad (DB) 4-axle passenger cars. Type AB4yge 'Umbauwagen', 1st/2nd class, type B4yge 'Umbauwagen', 2nd class, and type BDw4yge 'Umbauwagen', 2nd class with a baggage area. The cars look as they did around 1958/59. Decal set with different car routings included. Model: The 2nd class 'Umbauwagen' with a baggage area has Prussian standard design trucks, the 1st/2nd class 'Umbauwagen' has Minden-Deutz design trucks, and the 2nd class 'Umbauwagen' has American design 'Pennsylvania trucks'. Each car has factory-installed LED interior lighting and electrical wheel pickups. A decal set with different car routings is included for each car. Length over the buffers per car 22.4 cm / 8-13/16'. The 23429 passenger car set is being produced in 2017 in a one-time series only for Trix Club members. The class 75.4 general-purpose tank locomotive to go with this car set is being offered under item number 22793 exclusively for Insider members. 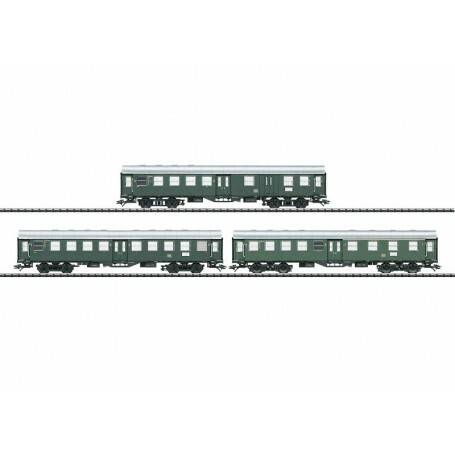 This passenger car set can be found in an AC version in the Märklin H0 assortment under item number 41324 exclusively for Insider members.